Rather than following pointers through the list from the beginning to the ith piece each time like $List does, the variable “pointer” keeps track of the current position in the list. Therefore, instead of n(n+1)/2 total “follow the pointer” operations (i in each of the n iterations for $List), there are now just n of them (one in each iteration for $ListNext). Finally, converting the string's pieces to array with integer subscripts may be a good option; in general, iterating over a local array with $Order may be slightly to significantly faster than $ListNext (depending on the length of the list elements). Of course, if you're starting out with a delimited string, it'll take a bit of work to convert it into an array. If you're iterating repeatedly, need to modify the parts of the list, or need to iterate backwards, this additional work would likely be worth it. The discussion has turned up a few other interesting variations with good performance, which are worth comparing to each other. See the RunLinearOnly method and the different implementations tested in the updated Gist. The following chart compares the While/Do...While versions of these methods. 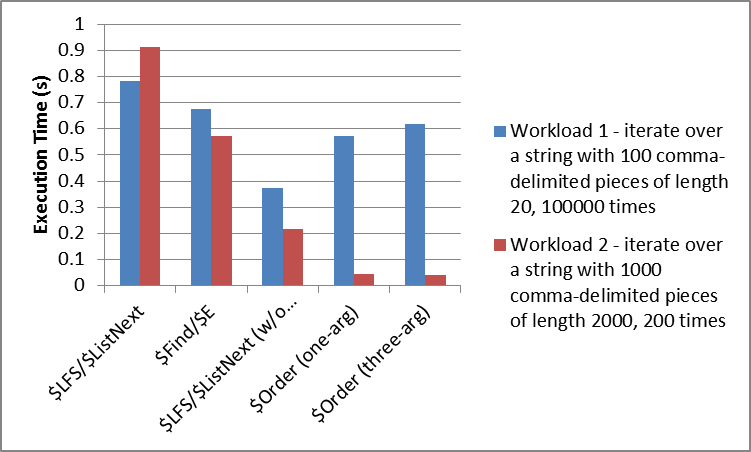 Particularly, see the relative performance of $ListFromString/$ListNext compared to $Extract/$Find, and of $ListNext (without conversion from string to $ListBuild list) compared to $Order over a local array with integer subscripts. 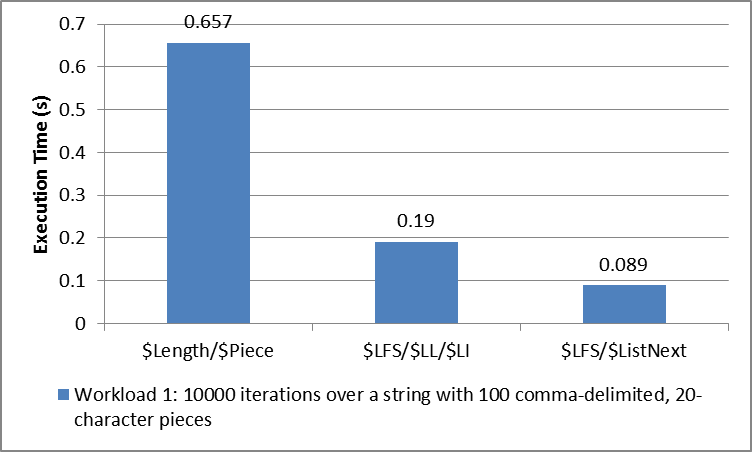 If you're starting with a delimited string, $Find/$Extract is the best-performing option, although the code is slightly less intuitive than $ListFromString/$ListNext. A While or Do...While loop performs slightly better than an equivalent argumentless For loop. I fully agree with hoisting constants out of a loop and have recently spent a while optimizing code to use $listnext in SQL and so agree it is a much faster way to iterate over $listbuild structures. As you can see it always stops at '2' rather than going on to '10'. Also there is overhead in converting from a delimited string into a $list format in order to use the more efficient $listnext, you can avoid the O(n^2) overhead with the regular $piece(string,",",i) code in a loop using $find with a starting position and then $extract the item you need. This should perform better than $listnext version of the loop at least for mid sized strings as it avoids the conversion overhead. Graphs (and measurements in a method) include conversion times. It was slow. Is there any way to write this faster - eg. without select (or other condition for the last piece)? Tried it again, got the same results as you. 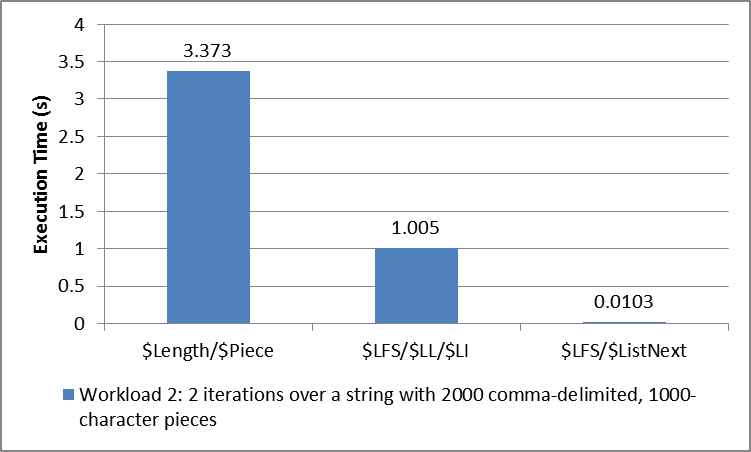 $find performs better on both short (20 chars per piece, 100 pieces) and long strings (2000 chars per piece, 100 pieces). Ed, what macros $$$START and $$$END do? #define END Write ($zh - start)," seconds",! Thank you for pointing out both of those things! I'm not sure why I thought the end condition was evaluated each time. I'll update the post to avoid spreading misinformation. Which is faster, as 'for' is generally faster than 'while'. Nice. I'll add a section comparing the O(n) variations this week. FYI: I get consistently slower performance with the 'for' loop variation here (around 10% slower) so at least in my simple test the while loop both looks nicer and runs faster. Thank you, Mark, good to know. This correctly deals with a trailing comma in the list, e.g. if a]"" was faster than if a'=""
But we always reminded people that these things could change from platform to platform, and that extra database references were usually much costlier than the differences between coding things one way vs another. So, Tim, if you've got the time, please tell the Community if your tests show different values on Windows vs Linux vs Unix vs OS X. And (this might be harder), give us your opinion on a "tipping point" or a "when to care about this point"; that is, if the delimited or list string has fewer than N pieces/items, it really doesn't matter which method is used, but above N, use the $listlength method, and above M, use $listnext. Something like that. I think only profiler for the exact case can really answer this kind of questions. Too many nuances in the real-life code for one-fits-all solution of any kind to be feasible. Further, if the relative performance of different approaches changes with version updates or is different across different platforms, the use of foreach would also remove the need for any source code changes on the part of the developer. Maybe some $$$ForEach macro would be helpful here? Really nice topic! Thank you.